The Scout sign shows you are a Scout. Give it each time you recite the Scout Oath and Law. 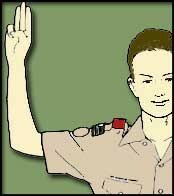 When a Scout aises the Scout sign, all Scouts should make the sign, too, and come to silent attention.